Olathe South's Russell White. KC Star. 1. Olathe South (0-0): The Falcons are pumped to kick their season off with rival Olathe East. Nothing would set the standard for 2012 like a great performance in week one from what could be the league's best team in the defending 6A state champ Falcons. 2. Lawrence (0-0): The Chesty Lions handled SM West pretty easily in week one last year. Do the same this year and it will validate LHS, because we know SM West is going to be much improved from 2011. More than anything LHS will be praying that the injury bug that has plagued them in recent years is gone. 3. Olathe East (0-0): Olathe East has won 12 of their last 13 season-opening games. The Hawks will come prepared to win--the fact that the first game is against rival Olathe South just provides more incentive for the team. 4. Lawrence Free State (0-0): The Firebirds have spent the majority of their offseason practicing on turf but their first game will be on the grass at CBAC against Olathe Northwest. I'm not expecting a change in the potency of the Kyle McFarland led offense, however. 5. SM West (0-0): The Vikings were embarrassed in week one at Lawrence last season, yet they still managed a solid seven-win season and Sectional berth. You know they're chomping at the bit for a chance to dim LHS' preseason expectations, just a bit, early on. 6. Olathe North (0-0): Game One of the Gene Wier Era Part II is at a stadium (the new SM North District Stadium) that didn't exist the last time Wier was coaching at Olathe North. It will be the first of many nuances around the league for the coaching legend. 7. SM East (0-0): There's nothing like taking on your rival in week one. The Lancers will be dressed in all black and SM South in all white. This will be Jordan Darling's first chance to make an impression on the league. 8. SM South (0-0): See SM East. The Raiders' schedule is manageable this year and nothing would get things started on the right foot like a victory against their rival. That 95th Street border gets more and more intense with each student who transfers or is denied transfer, between the two schools. 9. 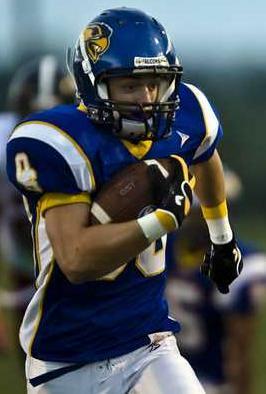 Leavenworth (0-0): Leavenworth has preseason expectations for the first time in over a decade. How the Pioneers do in the early part of their schedule (at SM North, SM South, SM Northwest) will be key. 10. Olathe Northwest (0-0): The Ravens will have to play to their strength, the offensive line, early on in 2012. How effectively they can establish a run game to keep possessions away from Free State's offense could be essential in week one. 11. SM Northwest (0-0): The Cougars may be sitting very low in terms of expectations but the program is in good hands under new head coach Linn Hibbs and there's really no telling how soon they could possibly click and surprise us all. 12. SM North (0-0): The good thing about starting the season at the bottom of the Power Rankings is that there's only one way to go--up. That's cliché but the Indians have a week one opponent in Leavenworth who they're familiar with and you know Dennis Grayless' team will come prepared for a dogfight. Eli do you have access to post teams' rosters on your site? I note the SMW site link to their roster does not work. I can't remember the kid's name who was backing up Armani last year who presumably will be the starter this year but he seemed pretty decent when he played. I guess that's the big ? for the vikes, whoever the new QB is certainly stepping into a good situation with a lot of pieces in place around him. Also I'd love some investigative reporting sometime on how the SL schedule is made each year. SMW opens with 3 out of 4 on the road again this year after opeing with 4 out of first 5 games on the road last year. Also we are playing Lawrence, ON and OE again just like last year. It seems it must be 4 of the last 5 years or maybe 4 of the last 6 that we've had 5 road games and only 4 @ home. Is there no attempt to balance this year to year? Also I can't remember the last time we got to play ONW. I'd be curious to find out just what criteria are used in the process. For rosters we're all really at the liberty of the individual team sites. Many of which aren't updated regularly. works beside the fact that they try to make sure Olathe and SM schools play every team in their school district each year. That being said, right off the bat it makes no sense why SM West starts at Lawrence this season, after starting on the road there in '11. Simple "errors" like that make no sense to me. It seems like that would have been a simple rotation. I personally think each team should have to schedule one non-league/non-district opponent each season the way they did up until 2003. It would provide better competition and more hype for the league as a whole. And I'm not talking playing Topeka or Wichita schools, but actually scheduling teams out-of-state like Rockhurst or the Blue Springs or from cities like Omaha, St. Louis, OKC, etc. Eli, the schedules are made by the Athletic Directors of the sunflower league at a meeting. KSHSAA hands down the districts, and the ADs pick it up from there. The Sunflower league has scheduling rules set forth by the league itself. Yes, the Olathe Schools all have to play each other every year, just like the SM schools as you said. League schools are not allowed to schedule outside the league. No particular reason other than they want sunflower schools to have priority in the scheduling. The only time a Sunflower League team will EVER play outside the League is when their districts force them too. Until the League changes the rules, it will always be that way. East plays all 4 Olathe schools in a row after the South rivalry game so you guys can't complain too much about scheduling... Just saying. Right, and I'm assuming that rule (only playing SL teams) was implemented in 2004 because Olathe Northwest was added that year. That being said, it's something that should be reevaluated. At the very least it would be nice to see something like half of the teams being able to schedule out-of-league games every other year, the other half the other year, just to spice things up. I'm just saying the home field thing always seems to go aganst SMW. I remember one year we opened @OE and @OS. We have 5 road games yet again this year. Not sure how they always manage to work that one out. And could we, just ONE year have ONW and LV on our schedule? Preferably both on the road so some of these other top teams can play at SMW for once? Impaler, I don't have a lot of sympathy for smw. The last 6 years smw schedule has ranked 25, 20, 30, 32, 16, and 10 out of 32 teams. Compare that with OS which had 3, 8, 14, 4, 1, and 20. I'm sure they would trade schedules with you any day. I think OE has had even tougher schedules in the past (though they get a break this year with their district). Look, I know we play SMN, SMS, SMNW every year and that's not comparable to playing the Olathe schools. I have no problem with playing good comp out of our (school) district and would never miss an opportunity to play OE. I'm just asking for the home field to be a little more equitable than it has been. If LAW were at SMW this week and we had 5 home games this year after 5 road last year, I'd be fine with our sched. As it is I think we can beat LFS and ON and come out of these first four games 2-2 then win out to go 7-2. But as Eli said starting at LAW two years running is just not right. Come on... It's not like your away games are all road games if you know what I mean. True away games for SM schools are at LV at LHS at LFS at ODAC and at CBAC. Does it really matter if it's an away game at SMSDS or SMNDS? Same amount of fans, your band is there, full cheer squad etc etc. only difference is black and white... Literally with unis. True but the last year 3 of our first 5 games were @LAW, @ON and @OE. This year 3 of our first four are @LAW, @ON and @OE. I sense a pattern here. You just can't get much tougher than that. Sure the second half is a cake walk...if we can survive the first half.